It took not long to make but was crafted with a great deal of community love, prayer and care. 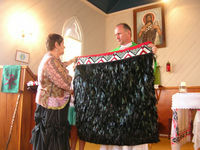 The Maori community of the archdiocese presented Msgr Gerard Burns, their chaplain for the past three years, with a korowai or Maori cloak, a mark of respect for his 25 years of priesthood. Shirley Kelland designed the korowai then handed it over to the ‘many willing hands’ who worked it to completion. These included Deirdre Russell, Pam Whanga Tuki, Pauline Takiwa and Gina Rollandi who spent many hours sewing it together. Shirley says Mike Cossar was meticulous in boring the holes in the paua shells. Sr Makareta who began the project bought most of the feathers and Shirley included some Tui feathers in the mix. This means that the korowai is contemporary. ‘It was really about everyone coming together to work on it with lots of prayer, love and care. It was not a rushed job. The korowai depicts Aotearoa starting with the red of dawn and the Southern Alps, the backbone of New Zealand. The land and the waterways are represented in the green with white through it and the mountain peaks cross the North Island especially Tongariro, Ruapehu and Ngaruahoe. The pieces of paua represent the Maori kai (food) as in the wisdom of the Word. Each time those making the korowai came together for their craft, they prayed to Our Lady for love and guidance and support, ‘Because Mary is an integral part of our family’s life,’ said Shirley. Our Lady became significant for the construction team in that she brings people together with a sense of the hope of the resurrection. 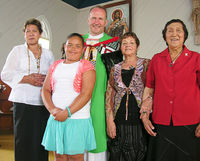 The community presented Msgr Gerard Burns with the korowai during Mass at Te Ngakau Tapu on February 7, a week before his jubilee.